Download the digital version of our April 2019 “Gaming” issue at NativeBusinessMag.com/digital, and sign up to begin receiving free print copies of Native Business Magazine at NativeBusinessMag.com/subscribe. This week the April “Gaming” issue of Native Business Magazine is being distributed at the National Indian Gaming Association (NIGA) 2019 Tradeshow & Convention, taking place April 1-4, at the San Diego Convention Center in San Diego, California, wherein every attendee will receive a copy. In addition to circulating at NIGA’s staple event and shipping to subscribers around the world, every member of Congress will receive our “Gaming” issue. It will also be provided to attendees at upcoming events across Indian Country including the Native Women’s Business Summit in Albuquerque, New Mexico, the Affiliated Tribes of Northwest Indians – Economic Development Corporation Economic Summit in Portland, Oregon, and at the 4th Annual Navajo Nation Economic Summit 2019, being held at the Twin Arrows Casino Resort in Flagstaff, Arizona. Our first-ever “Gaming” issue and fifth edition of Native Business Magazine pays tribute to the powerful economic engine that is gaming. 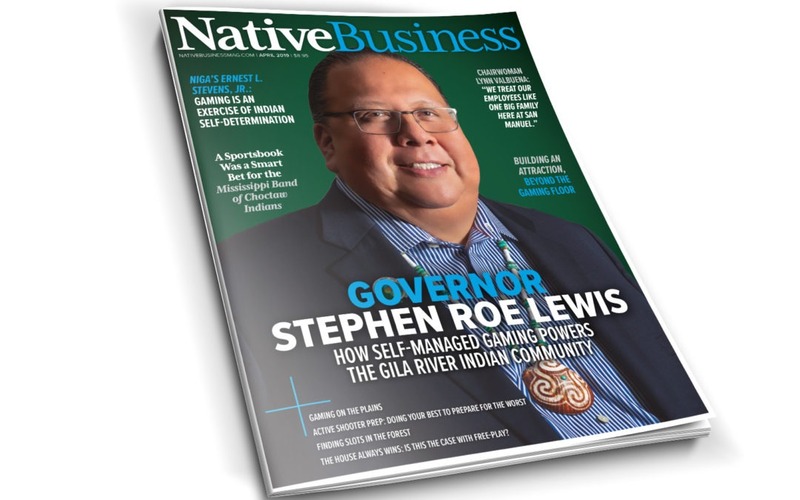 Our cover subject — Gila River Indian Community Governor Stephen Roe Lewis — shares with Native Business readers how the Community’s self-managed gaming operations support self-reliance. Gov. Lewis also offers a glimpse of the Community’s rich and resilient history, highlighting the diversion of water on the Gila River more than 150 years ago that caused their agriculture-based economy to collapse. In 2004, their water rights were finally restored, and they’ve since revived farming and agriculture. “The Gila River Indian Community’s gaming enterprises are a shining example of excellence in the casino and hospitality sector. The economic development, leadership and vision demonstrated by Gila River’s Governor Lewis, their Tribal council and executives, have resulted in essential Tribal infrastructure like schools and housing for the Community’s 23,000 members,” said Gary Davis (Cherokee Nation), Publisher of Native Business Magazine. Our gaming issue offers a unique, inside perspective on sports betting in Indian Country. We spotlight the Mississippi Band of Choctaw Indians, who opened the first Tribally owned and operated independent sportsbook in the United States in August. “Do not wait one minute if you think you want to open a sportsbook. Either get a consultant that knows the sports business for you or start hiring talent that has experience in sportsbook platforms,” said Neal Atkinson, Director of Table Games (Poker, Bingo, and Sportsbook Operations) at Pearl River Resort. For our April gaming issue, we also speak with Lynn Valbuena, Chairwoman of the San Manuel Band of Mission Indians. In the 1990s, Valbuena and her Business Committee were instrumental in advocating for community and political support, ultimately leading to the state legislature passing a constitutional amendment that provides exclusive rights to Tribal governments in California to offer casino-style gaming. Today San Manuel Casino and the Tribal government are among the largest employers in San Bernardino County, currently supporting more than 4,900 employees and generating more than $1 billion in annual economic activity in the region. In our feature “Gaming on the Plains,” Native Business examines the positive influence of rural casinos on Tribal and local economies. Tribes have gone from operating modest community bingo games to running sophisticated, state-of-the-art casinos that generate critical jobs and spur economic activity on remote reservations across the Northern Plains. Today gaming destinations offer so much more than a casino floor. Our article “Building an Attraction, Beyond the Gaming Floor” showcases the myriad avenues Tribes have pursued to reach a larger and broader demographic. “It has been invigorating to witness how Tribal Nations have successfully expanded their portfolios over the years to include tourism attractions and activities that create synergy with their gaming facilities — from golf courses to luxurious spas to outdoor adventure venues. For instance, Foxwoods Resort Casino, one of the country’s first large-scale casino resorts, will debut its Foxwoods HighFlyer Zipline on April 12,” said Carmen Davis (Makah Tribe), Publisher and Executive Editor of Native Business Magazine. While gaming has opened doors of opportunity and restored Tribal economies, threats to safety come with the territory. Brian Decorah, CEO of Snoqualmie Casino and an enrolled member of the Ho-Chunk Nation, shares with Native Business how he and the Snoqualmie team developed an active-shooter training program with live simulation to prepare employees for a worst-case scenario. “It’s proactive measures and forethought like this that save lives, and we are happy Mr. Decorah is helping to lead the way, and we are thrilled he will be presenting at our upcoming Native Business Summit in May,” Gary said. In our April issue, Native Business also demonstrates the impact of entrepreneurship on gaming. At the cusp of the Tribal gaming industry, Cherokee Nation entrepreneur Kevin P. Thornton launched a business, KP Gaming, manufacturing tables and supplying casinos. Nearly three decades later, he recounts his journey for Native Business — from woodworking in his garage to earning Tribal clients across the United States, to building table games for gaming markets around the world from Mexico to Macau. In the article “The House Always Wins: Is This the Case With Free-Play?” Native Business takes an analytical look at the popular promotional tactic across the casino industry: free-play. Kate Spilde, Chair of the Sycuan Institute on Tribal Gaming, and Anthony Lucas, another academic who studies the impact of free-play, break down the different types of free-play — discretionary and earned, and shed light on why measuring the benefits of free-play is a case-by-case scenario. Because so many Tribes have demonstrated self-determination and perseverance to fight for and secure exclusive rights to casino-style gaming within their states, Indian gaming has become the bedrock for Tribal economic resurgence. “Today, 32 years after the Supreme Court victory in California v. Cabazon and 30 years after the passage of the Indian Gaming Regulatory Act, Indian gaming continues to evolve. Tribes, ever-resilient, are keeping pace with it — and leveraging gaming for the greater good of their communities, while making a positive impact on their regional economies,” said Native Business Magazine Publishers, Gary and Carmen Davis. Subscribe today to download the digital version of the magazine at NativeBusinessMag.com/digital, and sign up to begin receiving free print copies of Native Business Magazine at NativeBusinessMag.com/subscribe.